With MyFigueroa nearing completion, we are revisiting the project's history and how the first planned and complete street in the city of Los Angeles came to be. With this post today, we are taking a look at the history of MyFigueroa's funding. That history starts in 2008, with the Community Redevelopment Agency Los Angeles (CRA/LA) and a $30 million Proposition 1C grant from the State of California Infill Infrastructure Grant Program through the State Housing and Community Development Department (HCD). Proposition 1C (the Housing and Emergency Shelter Trust Fund Act of 2006) funds infrastructure for new development in urban areas, with the goal of making streets, sidewalks, and transit more accessible for residents of affordable housing. MyFigueroa is about more than safety and biking between South LA and downtown; it is also about encouraging the development of new housing along the Figueroa corridor and in the entire project area (including 11th Street and Martin Luther King Jr. Boulevard)—as well as providing new (and safe) transportation options to connect new residents and visitors to transit, parks, and other parts of downtown. When the project funding was granted, there were at least 12 planned housing developments within the project area, with over 2,200 planned units (338 of those slated to be affordable). 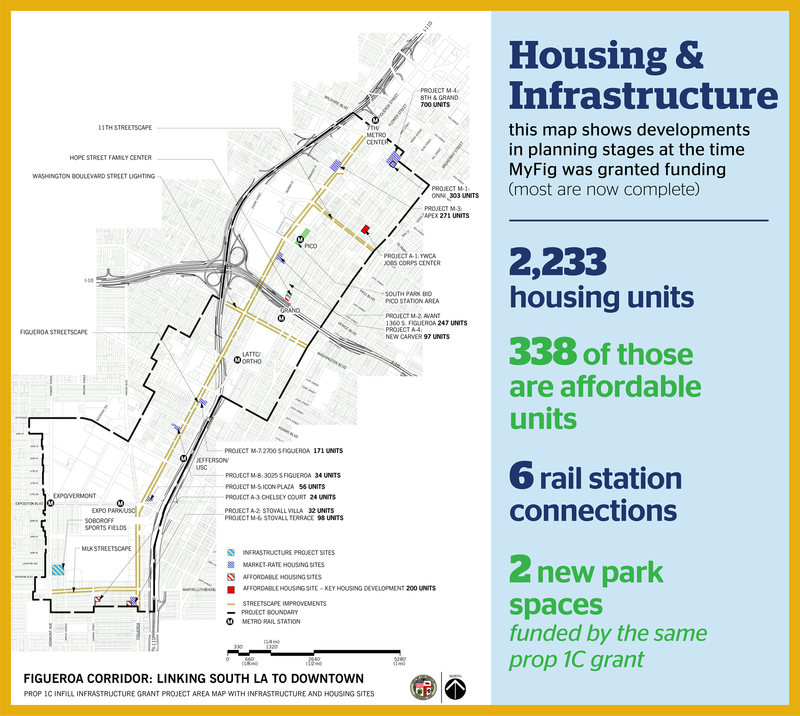 Now most of those developments are complete, and the stretch of Figueroa through South Park and towards Exposition Park has already been transformed into a denser, more vibrant area. Parking lots have given way to new businesses and new homes—including the YWCA Los Angeles Jobs Corps Center (Olive and 11th Streets), which provides 200 new units of affordable housing, as well as career technical training for young people. The same Prop. 1C grant also funded new parks along the corridor, an area historically without enough open space. These include Soboroff Field at Exposition Park and Hope Street Family Center at Venice Boulevard, operated by California Hospital Medical Center. The transformation of MyFigueroa will provide downtown residents with expanded access to numerous local businesses, places of employment, and public transit hubs within the downtown area. At a time when Los Angeles is struggling with a housing shortage, making the connection with how new infrastructure can facilitate new housing and denser neighborhoods can help us to develop more housing options. We are looking forward to walking, biking, rolling, and strolling on Figueroa and 11th Streets with all of the new neighbors who have come to Figueroa and the South Park neighborhood along the way!